It is reported that Rajapaksas are engaged in racist conflicts in the country. Former Minister Basil Rajapaksa said that if Mahinda did not act as Prime Minister for the last 50 days, the country would be broken into several divisions. 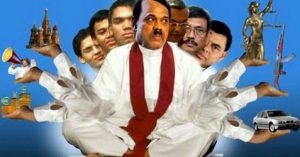 The Rajapaksa is said to have been involved in the provocation of communalism after the defeat of the 50-day illegal conspiracy. The parliament or the courts did not accept the post of Mahinda prime minister. Mahinda Rajapaksa resigned from the post yesterday. Speaking to the people of the country, Mahinda said that the remote Tamil National Party, which has 103 MPs, has said.